This project is week 3 in the Dare to DIY Challenge: give handmade. A couple of years ago I made similar gift bags as party favors at my Tacky Christmas Sweater Party. I decided to make a batch again this year for party favors, and to hand out as little gifts to the mailman, neighbors, etc. To begin, I made this recipe for cocoa blocks from the King Arthur Flour website. I followed the recipe as written, except instead of switching on and off from the stove top, I did all the melting using the double-boiler method. To make the hot chocolate cubes into hot chocolate on a stick gift bags, you just need a few more items. Cello bags, lollipop sticks, marshmallows and ribbon. Insert lollipop sticks into each cube. Put a handful of marshmallows in the bottom of the cello bag. Place 2-3 hot chocolate cubes on top, and tie the bag closed with festive ribbon. I chose this reindeer sweater inspired ribbon to go with my party theme. To serve, stir one block into a cup of hot milk. When it’s dissolved, add marshmallows, and enjoy! How stinkin’ cute are these? And I think they’d be such a great party favor. Thanks so much for linking up to Dare to DIY! I love this idea! So cute and so fun!! Could be used as gifts and favors- it’s perfect! I pinned this! Visiting from Take-a-Look Tuesday! Oh yum! These look adorable! Mmm, sounds good. Love the ribbon too. 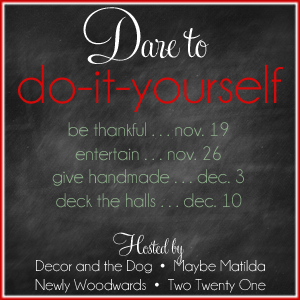 Thanks for joining the Dare to DIY! What a fun idea! And it sounds yummy! oh will have to make these – they look yummy! They really are. Much better than the old powder packets! I am planning to make these as baby shower favors. I was wondering if those lollipop sticks dissolve at all in hot milk since they’re sort of a pressed paper? I wasn’t sure if I needed to buy wooden sticks instead. Thank you! It only takes a minute or two for the chocolate to melt, so it’s not in the milk nearly long enough to dissolve the stick. But, wooden sticks would work fine too!